What’s the difference with other hair styling products? There must be thousands of different hair styling products for men out there. It’s the sort of overwhelming variety that’s made picking the best one a near-impossible task. But if you take the time to learn about your hair and style, the various products, and their effects, it should be a lot easier picking the one that suits you. One of the most preferred styling products across the world is pomade. Usually men with short hairstyles prefer this type of product mainly because of the ease of application and its ability to keep their hair tamed for long period of time. This happens mainly because of the wax that most pomades contain. As you understood already, today’s guide is about pomades for men. After testing more than 30 different products we shortlisted 13. Upon that, we found the Suavecito Pomade Original and Seven Potions to be the best pomades for men with any hair type. Runner up is the excellent pomade from Reuzel which is also a product that many barbers prefer. Now, when it comes to lower budget options, we found the Old Spice to be the best cheap pomade and it’s especially good for men with longer and thin hair as it gives a nice, medium hold. The selection was rather tough as there are so many good products. That said, there are many different pomades that were almost as good as my own favorite Suavecito pomade. So, what should you expect to see on this guide? First, I’ll walk you through their history with their ups and downs, then talk about the criteria you need to consider before choosing one and finally, review some of the most well known brands out there. By the end, I hope that you find what you’re looking for. Before that, I’ll share with you a table with the 5 of the greatest pomades for men to buy now based on my experience along with some of their main characteristics so that you can make a comparison easier. Let’s start by getting to understand hair pomade a little. If you’ve ever seen it, you’ll notice it closely resembles another popular kind of hair product – wax. That’s because pomade is technically hair wax with a few extra features. Pomade is waxy and only applicable when you rub the wax between your palms to heat it up. What sets pomade apart is the fact that it’s not as shiny or sleek like hair gel or hair spray. It’s a really subtle sort of hair styling product that tends to make the hair look a whole lot more natural. But washing it off is not as easy. Washing off pomade takes several attempts with regular shampoo or a single attempt with a special formula that includes olive oil or lemon juice. Most modern pomades have a base made from petroleum jelly. In fact, petroleum jelly works as a hair styling product by itself and suits most hair types. The petro-base has minerals and added wax to turn it into pomade. Most off-the-shelf varieties have a little bit of fragrance and colors added in. The stiffest pomades usually have a ton of beeswax, while the lighter ones will have a heavy dose of light essential oils. If you think the word ‘pomade’ sounds French, you’re right. It originates from the French word for ointment and the Latin word for apple. I guess this is because the very first pomades had a mashed apples added in for texture. Modern ones have no hint of any fruits. The use of pomade dates back to the early-Roman empire. European tribes that lived under the empire used pomade made from soap. Bear fat was an important ingredient in pomade around this time and the recipe stuck around till the 19th century. Petroleum jelly, of course, found its way into the recipe around the 20th century, giving rise to the modern pomade formula. The most popular pomade of this era was Murray’s Superior Pomade. Originally Murray’s formula included lard and beeswax and was introduced to the public in 1920. It was quickly followed by Brylcreem (1928) and the Royal Crown Hair Dressing pomade in the late 1930’s. Teenage boys who were drafted to fight in the Second World War returned home with Dixie peach hair pomade as a favorite hair styling product. It remained popular in the United States till the late-1960’s. Pomades briefly lost their popularity after the 1960’s. They were replaced with modern formulas for hair gel and hairspray. But layrite produced the first water-based pomade in 2001 and brought it back to the marketplace. By reducing lanolin and beeswax, the new formula made it a lot easier to wash pomade off. It was also a healthier formula for hair and men started using it again because it felt lighter than gel or wax. What is pomade made of ? As we’ve seen, pomade formula has gone through a substantial transition over the years. Initially, the ingredients were able to hold hair up but were very difficult to wash off. It was traditionally made from bear fat or lard. After a few decades the formula was changed to include lanolin or beeswax. Modern pomades have a mix of water, petroleum jelly, and some essential oils. These ingredients help style the hair but also keep the pomade light and easy to wash off. The key difference with pomade is the fact that it never dries out. Unlike hair gel or hairspray, the pomade mix will last much longer. It’s designed to offer superior hold and a long-lasting effect, regardless of hair type. Pomade looks noticeably different once applied. It makes the hair look shiny, slick, and darker. The shine is a bit like hair gel but at the same time, it doesn’t make the hair hard. Even though pomade is designed to style hair, it’s great when it comes to beards and moustaches as well. The shiny and smooth texture offered by pomade was traditionally the key difference between pomade and wax. But over the years more pomades are been made with beeswax and hair wax has also become a lot lighter. For now, there’s barely any difference between wax and pomade besides the name. Pomade gained back popularity over the last years again for pompadour hairstyle Afro-textured hair is well-suited to pomade. The pomades tends to lock in moisture and makes it easier to style Afro hair. Now that you know the basics, it should be a lot easier picking the perfect pomade for your hair. While making a pick you need to consider your hair texture, pomade ingredients, brand, and the pomade base. You already know by now that pomade can be either oil or water based. Both these variations have certain advantages and disadvantages. Water-based pomade is a little weaker but is easier to wash off. Oil-based pomade offers a much better hold and tends to last longer. Unfortunately, it is also a lot more difficult to wash off. Most people will only be able to get rid of oil-pomade completely after a few washes. You may also have to get creative with oil-pomade and use a mix of warm water with olive oil to rinse it off completely. None of these are particularly convenient or healthy options, so I would suggest you stick to water-based pomades. The reason pomade works so well with Afro-textured hair is because it holds moisture for longer. This makes it really well suited to thick, dry hair and complex hairstyles like the ducktail, pompadour, & quiff. If you’re going to use pomade, petroleum jelly is usually unavoidable. But you can get your hands on more organic mixtures which could be healthier. Look out for pomades made from natural beeswax, minerals oils, and essential herbs. Brylcreem is the oldest pomade brand that’s still around. Another one is Murray’s Superior Hair Dressing pomade. Both of these brands have been on store shelves since the early 1900’s. That’s a sign of great quality. Of course, there’s a lot of other options with pomades now. Top-notch pomade brands like Reuzel, Natty Nattys, Jack Black, L’oreal, American Crew, and Wella are also worth considering. You can expect the average can of pomade to cost twenty bucks. Most pomades on the market range from $15 to $50. There’s a trade off between quality and ingredients with each brand. 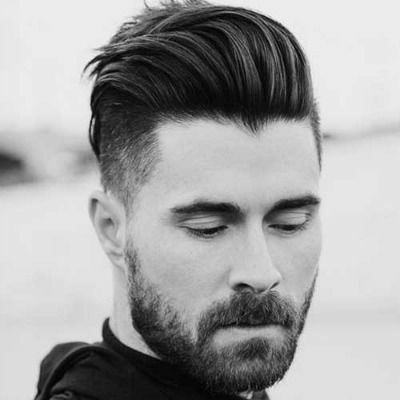 I’ve put together a list of the most popular hair pomades for men to narrow the list down a bit and weigh every product against quality and price factors. This one is water-soluble and a very light mixture that holds well. When it comes to hold, I would consider it medium and it’s working well for men with normal and thin hair. If you’re looking for strong hold, you might have some trouble sculpting your hair. I like the fact that it leaves barely any residue after you’re done rinsing it off properly. It’s also remarkably well-priced. The Uppercut Deluxe Pomade comes in a can of 3 ounces that can last for a month or two of daily use, depending always on the amount that you use. In terms of price, it’s not the cheapest pomade a man can get but it’s more like mid range. Overall, it’s a great hairstyling product and you won’t regret getting it. Second water based pomade, this time by Seven Potions. I’ve already used a few products by this company and not even once left me down. This pomade is no different. The particular pomade has a firm hold and the more you apply it on your hair, the stronger the hold. However, the same thing happens with the shine as well. If you apply just a bit and distribute it evenly across your hair, you won’t notice a very high shine. But once you start applying more, you immediately feel the grip and the shine that comes with the higher amount of product. No matter what kind of hairstyle you’re looking to rock, this hair pomade will help you achieve it. I found it working best for short and medium length hair. This doesn’t mean that it won’t work for longer hair but I just didn’t get the chance to try it out on such. Now, this isn’t only one of the best pomades you can get but it also has the most natural content among the reviewed products. In fact, it’s one of the few pomades on this guide that doesn’t contain synthetic fixatives like PVP and with no petrolatum -which is something that is found in almost all oil based pomades, hence the name oil based. This pomade is also suitable for vegans and it’s cruelty free, in case this is something that you look into when buying a pomade. Lastly, the price is somewhere in the middle, not too expensive and not too cheap either for a 3.4 fl oz / 100 ml aluminium tin. I’d say that you get exactly what you’re paying for and it’s a solid choice. An overall great investment. I’ve always liked Mr. Natty Natty’s hair products. This pomade is rather average though. This product gives you a bit of greasy feeling. Although I can appreciate that most pomades have similar texture but the particular one was slightly more greasiness than what I’d consider ideal. It also made it a bit more difficult to wash off, compared to others. Washing your hair at least three times to completely take the pomade off is the norm no matter if you apply a small or large amount. When it comes to fragrance, I wouldn’t say that it’s my favorite but this is really subjective. What I liked the most was the strong hold. It’s one of the strongest pomade reviewed on this guide. Once you apply it on your hair, it will make your hair stay the way you want it throughout the day. As for the price, it’s neither the cheapest you can get nor the most expensive. If you want strong hold and you don’t mind the very shiny look, this might be the perfect hair pomade for you. This Dapper Dan pomade is clean and very light. It’s water-based which means it’s easier to wash. You already feel that there’s almost no residue even after the second wash. The flexible hold was less than expected. It’s not going to stay on for more than a few hours. That being said, it’s not the product that allows you to sculpt your hair. But again, this really depends on your hair and hairstyle. Styling with it also required more volume than I’m comfortable with. But it does smell great, which is what really sets it apart. It’s a great product but I wouldn’t consider it the best pomade for men with thick hair unless you’ve got longer hair. For sorter hair, you might want to look at something that gives you a stronger hold. It works well when it comes to classic hairstyles where you use a comb. Cost wise, it comes at reasonable price and for the quality that you get, I think it’s a solid choice. Jack Black has the sort of sophisticated marketing and packaging you wouldn’t expect at this price point. I’ve used several products from Jack Black in the past and in fact, I’m a fan of their traditional shaving cream. For the price that you pay, it’s better than a lot of other pomades in its class. The hold is medium and the fragrance is excellent. It gives your hair a very natural look which means your hair won’t look too shiny. It’s suitable for all hair types and length. For all the above and the excellent fragrance, I think this is not only great for your hair but it could be a good idea to style your beard with it. This all-American brand has always offered a sleek collection of grooming products. They say this pomade has natural scents and no synthetic additives, which is why it’s been included on this list. You can tell the product has good quality when you use it. It’s got great hold and a very light, effortless feel to it. The best thing about it is probably the price for the quality. It’s half the price of the average pomade, and it’s one of the cheapest pomade for men reviewed here. If you’re short on cash, this is probably a great pick at this price level. Water soluble pomade all the way from Japan. This pomade is light and really easy to tack on. It holds up really well and lasts surprisingly long. The one downside, in my opinion, is the overwhelmingly fruity smell. I’m not a big fan of sweet fruit flavours on my head and beard, so this is something to consider before choosing this one. But it’s probably not a dealbreaker for most men. If you’re into sweets scents, this could be the ideal pomade for your hair. On the plus side, it’s well-priced and well below other products that hardly have the high quality of Fiber Grease. Layrite is a well known grooming brand, and for good reason. This 4 ounce can of pomade is very well price and it holds up like a premium product. That being said, the particular pomade offers you great value for the price. A little goes a long way and you only need very little amount to cover your hair. The effects will last throughout the day. This is one of the strongest pomades you’ll see here and no matter your type and the length of your hair, you’ll have no problem styling it. From the times that I used it, I found it to work best when your hair is dry right after a wash.
One of the more popular brands among barbers is Reuzel. I’ve been to many barbershops and Reuzel is definitely among the most used pomades in barbershops. The reason? It’s not very hard to answer that. It’s well priced with good quality and performance. This is another water-based hair pomade. And as noted previously, water-based pomades wash off much easier. However, it doesn’t wash off as easily as Dapper Dan for example. This is a versatile pomade that can work with almost any hair type. I also like the soft feeling it gives to the hair. The pomade lingers on longer than expected. Guys that have thinner hair might feel that this pomade feels a bit heavy on the head. If I judge from my normal hair, it feels just right. All in all, it’s a very decent product and there’s no doubt that you won’t regret trying it out. After all, it’s no coincidence that professionals use it. Axe needs no introductions and it’s as popular as Gillette is with razors. Normally, I’m no big fan of AXE products (although I was using their deodorants and aftershaves during my youth). However, this pomade is much better than I expected. What makes it standout is the price which cost a third of some mid range products. In terms of hold, I would consider it medium and it’s good for any hair type. It also washes off fairly easily. If you’re into natural products, I think that this is among the least natural you can get. However, I must say that this product doesn’t feel heavy at all, it gives you a nice shine and the performance is very good. The Axe Clean Cut hair pomade is a very decent product and you won’t find anything as decent as this one at its price level. Is it the top pomade for men you can buy? I don’t think so. But it’s definitely one of the best to start with if you haven’t any previous experience with pomades. I just love the clever name on this product. I think this is a great purchase for anyone looking to buy a stylish hair pomade with a unique scent that won’t hurt his pocket and it’s considered among the most popular pomades to get among the hair styling aficionados. Another thing that sets it apart is the texture. It feels like cream rather than a hard wax and it’s very easy to apply it on your hair. But after you set it up and leave it in the hair, the cream solidifies and hardens to offer extra support. That being said, the hold is medium to strong and it lasts almost all day. It doesn’t feel as greasy as other products. With this in mind, a big plus is the fact that it washes off much easier than the majority of pomades. The Suavecito is probably the one of the top pomade for guys with any hair type as it combines quality, performance and great price, all in a 4oz container that will last you a good two to three months even with regular use. Can’t go wrong with this classic. Murray’s pomade used to be made of lard, but now it’s made of wax and petroleum jelly. Although there was a change in the formula, it’s still not easy to wash off. I had to try at last three times to wash the stuff off completely. Also, the sticky greasy texture isn’t for everyone. As for the scent department, I like the cinnamon-vanilla fragrance they’ve added in but again, it’s a matter of preference. Go for this if you don’t mind washing off thoroughly and prefer an old-school hair product. Imperial has a great range of hair products and not only that are highly preferred by barbers. This classic pomade is water-based and it gives you a ‘semi-shine’ effect. Applying it is really easy and so is washing off. The pomade dries up after a while and offers really good hold without making your hair look unnaturally stuck. Although, you’ll still get the shiny look that all pomades give you. As for the price, it’s really almost as much as the other products that are being reviewed today and it’s probably the cheapest pomade with this strong hold. Old Spice blows the rest out of the water in terms of price to quality ratio. It’s a pomade that offers a rather matte look (or let’s say not as shiny as others) and a medium hold. It’s a clean mixture that’s rather easy to wash off. It’s not among the greatest products you can get but it’s surely among the top together with the AXE to get you started with pomades. Overall, the Suavecito Pomade Original wins for price and hold quality. I love the way the creamy mixture solidifies after a while and dissolves in water easily to wash off. It’s also well-priced. This is a seriously good pomade that offers a balance between price and quality. Runner up for me is Reuzel that washes off very easily, gives you a nice medium hold and comes at a fair price. But again, I prefer products that make the hair feel more natural. On the other hand, if you’re looking for the most budget-friendly option, Old Spice and Axe pomades are the best. I’ve been reading lots of blogs because my hair does not like the products it is using right now. I like to have pretty short hair with a lot of volume with sort of a side part that went up a lot like a quiff. However, I have never been successful in styling it how I want it and I don’t like getting super frequent haircuts so now my hair is too long. I was using a hair wax that sort of worked, but as my hair grew longer, the wax was no longer very effective. Also, even when my hair was short, the hair near where my natural part is right by my forehead would stuck up randomly and look terrible and dry and unhealthy. I am currently using some random anti-frizz shampoo and conditioner I picked up at the store and it makes my hair dried-out, heavy, and unhealthy. My hair is very thick and I need a strong product for it (maybe clay?) that would hold well because I like a lot of “up” and volume but also not be super sticky and greasy because I have been made fun of for having too much gel in my hair before. Also, I need a shampoo and conditioner to keep my thick hair healthy. I want my hair to look something like https://i.pinimg.com/originals/7a/4d/4e/7a4d4e38a11e597d9b179cd3fa1f1747.jpg or http://alphahairstyles.com/wp-content/uploads/2015/12/quiff-hairstyle-1.jpg but I’m afraid that will never happen. Honestly, what products do you recommend? Please don’t just try and sell me products that you are paid to advertise for. That’s already happened to me. Hey Daniel, thanks for your thoughts. In order to decide upon a product, you’ll have to understand what each product does to your hair and what style you can get. A pomade for example, gives you a very shiny hairstyle and it’s not ideal for short hair. Hair clay on the other hand, gives you a matt to low shine hairstyle and it also adds volume to thinner hair. As your hair is thick and you’re interested in a low shine look, I’d invest in a sea salt spray to pre-style the hair and once your hair is dry, I’ll use a strong, low shine hair clay or paste. I hope that helps!